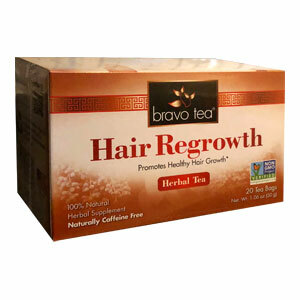 Hair Regrowth Herbal Tea restores the balance of yin and yang to help maintain healthy hair growth. Bravo Tea Guarantee: Our blends are handcrafted with only premium quality herbs. The herbs are sustainably sourced and Non-GMO Project Verified for the best Mother Nature can offer. Jasmine-infused flavor: The natural flavors of the precious herbs in each of our teas are delicately woven with the smooth and refreshing taste of jasmine flowers to create a deliciously balanced brew every time you enjoy a cup of Bravo Tea. Good for both hot and iced tea. For best results, use 3 to 5 bags daily.